This is a fairly large IPO R11 with VM Pro. A user states she was aware of half a dozen voicemails people left for her but she never received. 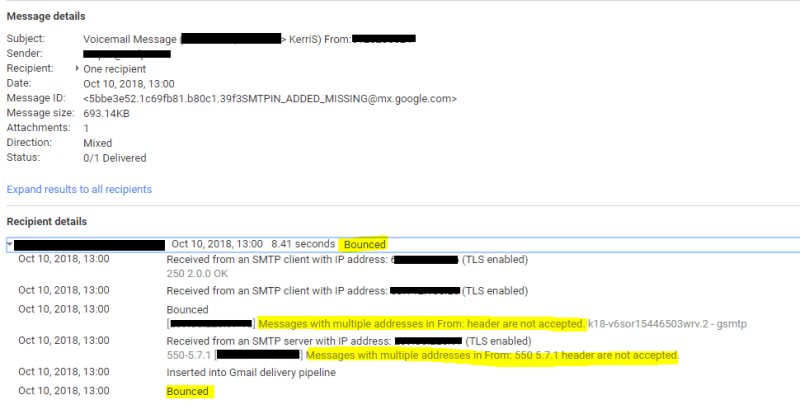 Looking though the email logs I found a few of the bounced messages and all had a bounce message that multiple addresses in the from: header were not accepted. I did another search for the whole domain over the past 30 days and found 30 messages with this status. This majority of the messages are getting through but I need to figure out why some are bouncing and get it resolved. Could it be that messages with multiple addresses in the TO field are not support on port 550 using version 5.7.1, i wonder? Use a single email adress and get the recipients access to that email address IN ADDITION to their normal email address. Or use a distributed groip in Outlook.